Oprah Winfrey’s lucky audience of 302 landed in Australia on Tuesday for the talk show diva’s Ultimate Giveaway show which is compromised of a glorious eight day adventure i n Australia! Winfrey’s 25th season premiere of her last season started of with a huuuuuuuge bang. She surprised her “ultimate” fans who just happened to be in her audience with a all inclusive trip to Australia. 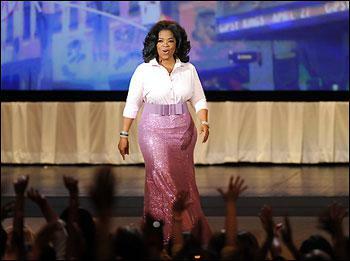 The audience members were chosen by Winfrey’s crew because they were Oprah’s most loyal viewers. Folks, it was an emotional episode— I cried, I wasn’t there, and I’m a deeply loyal fan. Winfrey is scheduled film at least two episodes of her daytime show at the Sydney Opera House (The Australian media has dubbed the “Oprah” House). A third, and possibly even a forth episode will also be filmed but it’s location is under wraps. All episodes are scheduled air in January and we are so excited to see them!!!! The super excited travelers, ranging in age from 18 to 75 happily waved to Australian reporters as they arrived in Australia. Winfrey is expected to travel via private jet and arrive on either Tuesday or Wednesday, but Oprah will keep us guessing as her exact travel itinerary is also being kept a secret from the public! Oh Orlando, let Oprah take care of you and have some fun! Australia is paying approximately $4 million for Oprah’s big trip, between federal and state governments. Australian officials explain the price tag is hefty, but it’s a pennies compared to the millions they are expected to gain from all of the tourism advertising that Oprah’s Australian episodes will bring in profits! Oprah’s traveling audience will have a super tight and awesome schedule. They will check out the Great Barrier Reef and other Aussie hot spots. Oprah’s “ultimate” fans will also enjoy everything under the sun from snorkeling, to nature hikes, surfing lessons, and even barbecues on the beach! Have fun audience and we can’t wait to be jealous of all of the fun you will be having!!!! Ps– I hope you all get cars and houses from Oprah.